As I was researching restaurants to check out during my recent trip back to Chicago (Go Wildcats! ), I knew I had to check out Alinea, Giordano's, and Portillo's. But when considering brunch with some Chi-town friends, Bottlefork was at the top of the list. I'm glad it was. There seems to be some innate hate for Rockit Ranch Productions, which is known for it's "Guy Fieri"-esque restaurants and nightclubs. But it's clear that they knew what they were doing when they decided to go down the route of bringing in Chef Kevin Hickey, who received four stars as the chef at the late Ritz-Carlton Dining Room. Once I saw that Chef Hickey was quoted in the Chicago Tribune as respecting the Le Bec-Fin's of the world, I knew I had to check it out. Located between Rick Bayless' Frontera Grill and Bub City (review to come! ), the space is sleek, yet comfortable. There are a few counter seats to watch the action in the kitchen as well. For brunch, Bottlefork offered a $6 white sangria, which was a good bet for easy drinking - bright and refreshing. The GF and I decided to go down the route of Blood Mary's. Bottlefork offers three and she went went with the middle of pack. The Starlite vodka went well with the house mix and the San Marzano and plum tomato puree offered some tart, bright flavors accentuated by the lemon juice. The toppers included what I believe was a pickled quail egg and radish - wholesome brunch indeed! Obviously, I went over the top with the premium offering - the Slaughterhouse Mary. North Shore Brewery's Aquavit had hints of caraway which paired well with the slaughterhouse stock. The plum and San Marzano mix helped to temper the savoriness of this tipple. Topped with a smorgasbord of salumi, sausage, chicharron, and pickled quail egg, this was clearly meant for the belly of this pig. It didn't end there though - both Blood Mary's were accompanied by a sidecar shorty of Rhinelander - light and smooth. At this point in the meal, the kitchen sent out a complimentary slab of maple bacon, proclaiming it was for the "belly of the pig. "Whether it's brunch or dinner, you should order the bacon if it's on the menu. It's done right - thick cut, crispy, yet almost braised within - it's worthy of a steakhouse menu. Simply delicious. As a sweet starter, our group went with the donut holes, which were decadent, yet light. Creamy and moist within, with a caked glaze exterior, perfectly accented by the slightly tart jam. 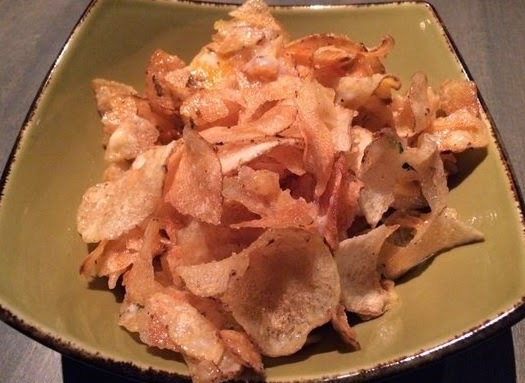 With our Yelp check-in, we also received the popular crisps and eggs - and rightly so. Our server brought a paper bag filled with house-made chips and a lightly poached egg and shook the contents table-side - a nice, interactive touch. The chips themselves were crispy indeed with a creamy dressing adding some richness. But the real star here? The malt vinegar powder which had some pop to each bite. Our friend Alex went with the baked french toast, which was served from the cast-iron skillet table-side, so as to scrape off any excess drizzle. If you've got a sweet tooth or any taste buds at all, you need to get a bite of this dish. It was so decadent it ate like cake - the richness of the syrupy glaze was tempered (ever so slightly) by the strawberry rhubarb compote, with the rhubarb adding the necessary tartness to each bite. Good thing Alex ran 7 miles the night before! The GF felt like going a little south of the border so she went with the sope, which I typically find to be a bit dry. While I appreciate that the toppings are meant to add the oomph to each bite, I appreciated that Bottlefork's sope was moister than most. The chorizo provided some heat to complement the ranchera sauce, with the fresh guacamole and cilantro adding some herbal notes to each bite. Of course, the fried egg adding additional richness to complement the salt of the cotija. I'm not sure what made me order the dish more - the sheer oxymoronic phrasing of this dish or the fact that it had foie, lobster, and oysters in a po' boy. Either way, I'm glad I did. The crusty, buttery roll encased a bounty from both land and sea. The creamy richness of the foie acted as the mayo component to most lobster rolls, and complemented the perfectly cooked crustacean quite well. The crispy oysters added some additional briny richness, with the scallion accents adding some bite. I occasionally have thoughts of returning to one of my favorite cities in America. The service and, more importantly, the food at Bottlefork helps to underscore the fact that Chicago is not only about deep dish pizza's, hot dogs, and Italian beef sandwiches. Not every restaurant needs to be Alinea to put Chicago on the map, but if Bottlefork and Chef Hickey have a say in it, it's clear that Chicago chefs are proud of what they put out. FTC Disclaimer: A portion of this meal was provided by the restaurant. All opinions are unbiased and mine alone.